I got inspired by several moodboards, and ended up with this card. 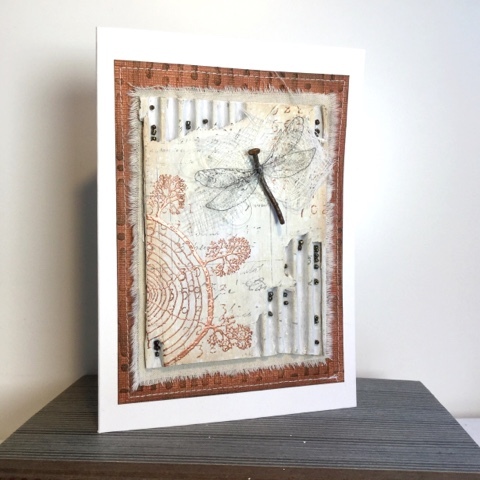 I'm posting it for the VivaLasVegaStamps challenge, check the moodboard and links here (inspired by foliage, nature, bugs, wings, numbers, script, invoice, background stamps, tan, black, white, brown, distressed, grungy and Corrie's lovely butterflies in this DT-post). 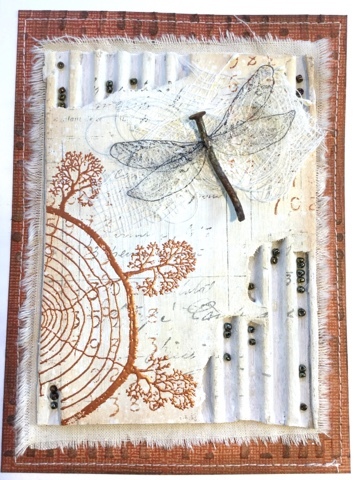 I'm also linking to the challenge at Our Mixed Media Moods. 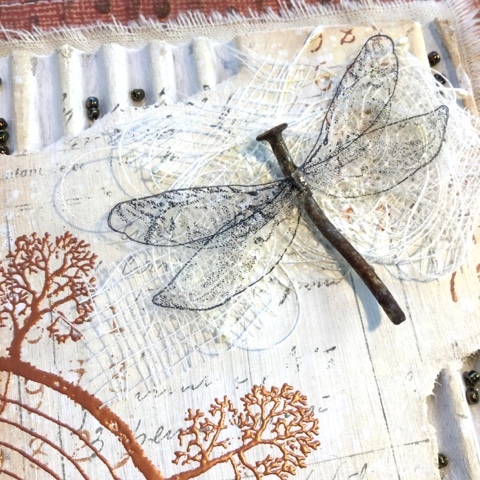 Their previous moodboard had lovely rusty bits and bobs, and that's when I started building the dragonfly. 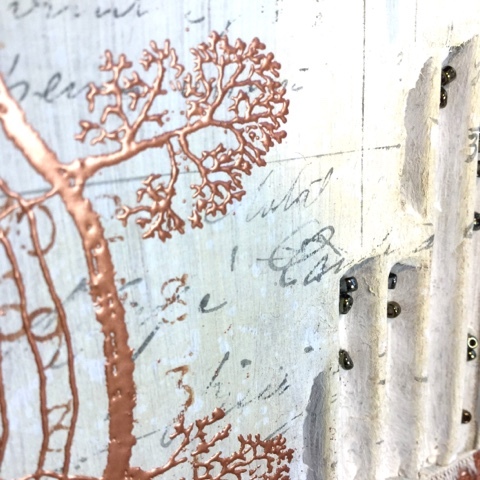 The new moodboard has wings, copper flower stems and fibres, so all in all the result is using everything but the magenta colours. All the stamps I used are favourites from VivaLasVegaStamps. I like to collect rusty bits that I run into outdoors, and this nail is one of those... I used pliers to straighten it a bit. The wings of the dragonfly are from "girl with wings". I stamped the wings twice on acetate, fussy cut them and tried to adhere them to the nail with gel medium. I wanted them on top of the nail, like on a real dragonfly. It didn't work, but they attached to each other, which was a step in the right direction. The next step was Glossy Accents, which seems to have done a good enough job. The fibres have been adhered with gel medium and once that was dry, the dragonfly was stuck down with some rolled glue dots. The background is cardboard with a layer of gesso. I stamped the Invoice and Numbers -stamps with Archival ink. This Tree Circle stamp is one of my first VLVS stamps! I stamped it with Versamark and embossed it with WOW Copper Pearl embossing powder. Love your dragonfly!!! Beautiful card! That is a great butterfly ! Thanks for joining us over at VLVS!